Why is it best to work with a Specialist Practitioner? Chrysalis Effect Wellbeing Coaching sessions are optional and highly recommended. They work alongside the Chrysalis Effect Online Recovery Programme. My experience shows to get the best results from the Online Recovery Programme it is recommend that you work with a Specialist Practitioner, such as myself, where I can coach you one to one, help you set and achieve your health and wellbeing goals, plus tailor the Online Recovery Programme to your individual needs. By working with a Specialist Practitioner and having Wellbeing Coaching sessions, you will also have access to the Chrysalis Effect Referral Team of Specialised Practitioners. Wellbeing Coaching sessions can be face to face or online, so distance is not a problem and you can work with me from the comfort of your own home. If you live close to me and wish to have a hands on treatment such as Nerve Reflexology or PhotonWave Light Therapy then you can visit me in person. Wellbeing coaching is a holistic approach to examining how your personal wellbeing interacts with your values, goals and motivations. It looks at every aspect of your life. 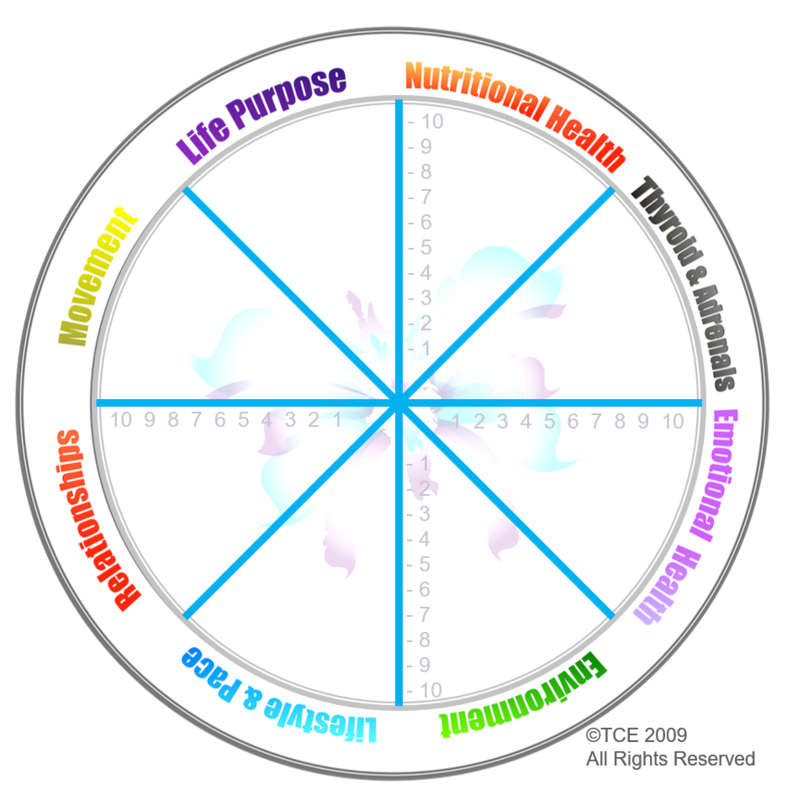 The Chrysalis Effect Wellbeing Wheel addresses 8 key areas such as, Nutritional Health, Thyroid & Adrenals, Emotional Health, Environment, Lifestyle & Pace, Relationships, Movement and Life Purpose. Having a Wellbeing Coach gives you that support and accountability to move forward and make the necessary changes to regain your health and vitality. Wellbeing coaching helps you when you are feeling stuck and would like to work through barriers to achievement, wellbeing and improving your health. It uses your own motivations and strengths and supports behaviour changes through a collaborative, non-judgmental partnership. How do the Wellbeing Coaching session work? Follow-up sessions are bought as a Package of Care, which can be broken down into sessions of 15 minutes to one hour depending on your needs and energy levels. During your Wellbeing Coaching sessions I work with you to help you set and achieve your wellness goals, help you understand who you truly are, and share coping skills with you for a well life. I can also offer Complementary Therapies during these sessions where appropriate. In my experience, where there is often the biggest resistance in addressing an area of the wellbeing wheel, this is the area where we have the biggest breakthroughs. This is why when working with me as your Wellbeing Coach I can give you the best support, guidance and encouragement you need to make these important breakthroughs. How does Wellbeing Coaching work with the Online Recovery Programme? As your Wellbeing Coach I can tailor the Online Recovery Programme to your individual needs. For example, if I feel that you would benefit from a session from Week 26 of the Online Recovery Programme and you are only on Week 6, I can tailor the programme and send you the sessions from Week 26. By working this way I can really make the Online Recovery Programme a personalised Recovery Programme designed around what you need at the right time. It is natural when we start any online programme for our motivation to be high at the beginning, racing ahead with our sessions and then slow down or stop over time, as life gets in the way or energy levels are low. Some sessions you may find that you have to delve a little deeper and we can easily keep putting off completing these and this is where working with me, helps keep you on track. When you work with me for Wellbeing Coaching, I take on the role as your Lead Practitioner. This means that you have one person that is overseeing your Recovery. As your Lead Practitioner I work with you on your Wellbeing Coaching sessions and also support you with the Online Recovery Programme, tailoring it to your personal needs. 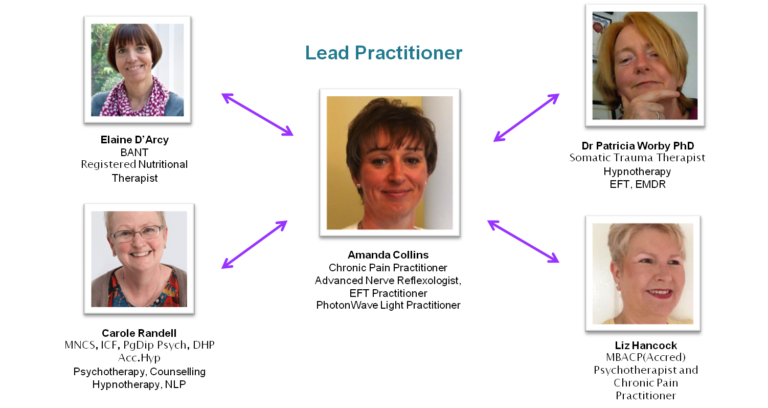 If I feel that you need additional support at any time, such as Nutritional Therapy or more specialised counselling or trauma release work, I can then cross-refer you to one of my fellow Chrysalis Effect Team Practitioners. If you are not within traveling distance to me and wish to have a hands on treatment then I can also cross-refer you to one of our Practitioners in your area. As your main Practitioner I will always take the Lead Practitioner role and oversee your Wellbeing Coaching sessions and progress on the Online Recovery Programme. You can choose to see the other Practitioner for that particular therapy alongside seeing me or complete the sessions with the other Practitioner first and then comes back to me as your Lead Practitioner to continue your Wellbeing Coaching sessions. I am very fortunate to work with an amazing team of Independent Accredited Specialist Practitioners.